Today is Mother’s Day. I have the best Mom in the world and she has been a wonderful role model for me. I love her very much and am so proud of her. We’ll be dining together tonight. 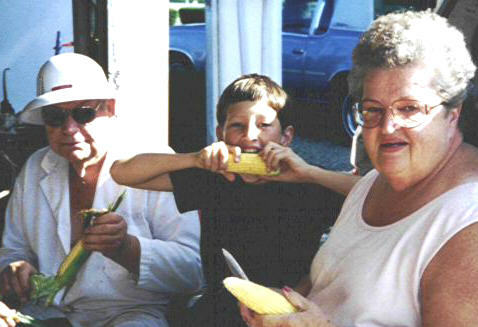 Mom, Dad, Chris eating corn on cob. Today is also my Dad’s birthday. I wrote this story years ago about one of Dad’s hobbies. Since it involves Mom too, I have included it here with some photos. Dogs were a big part of my parents’ lives. My children grew up playing with all of them and have good memories. Our son has a dog today, largely because of his happy memories of playing with pups at Grandpa’s house. Dad is gone now, but we still think of him and miss him. Happy birthday, Dad. We’ll celebrate with you someday in Heaven. 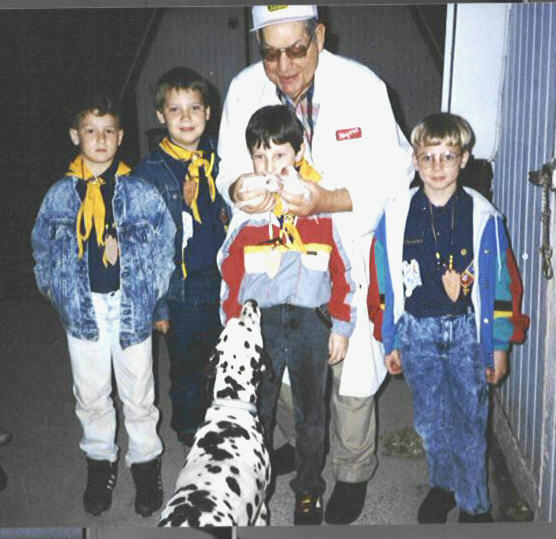 Dad shares Dalmatians with Chris and Boy Scout friends. In the Disney cartoon feature 101 Dalmatians, the main (human) character sings about the joys of living on a ‘Dalmatian plantation’. In real life my dad, Forace Hale Brewer, lived on a Dalmatian Plantation. He knew being surrounded by the spotted canines could bring years of happiness and contentment. Dad cared for animals all of his 78 years – from livestock on his family’s farm in northeastern Indiana during the 1940s to trading horses and raising hogs and steers on the 160-acre farm he and Mom bought years later. Dogs were a favorite pet. Mom and Dad always had a dog or two running around their barnyard. When Dad retired from working on the railroad in 1990, he turned his love of animals into a profitable business venture. He bought two adult Dalmatian dogs with plans to raise puppies. Mom’s reaction was not keen. “She thought they were the ugliest dogs she’d ever seen,” Dad used to say. “She told me to take them back where I got them.” To be fair to Mom, Dalmatian pups are born white and don’t receive their spots until they are approximately four weeks old. But Dad kept the dogs and Mom, a retired schoolteacher, became accustomed to them, even doing paper work for the business Dad called “Northfork Kennels.” At one point he had 25 adult dogs and dozens of puppies. Dad bought dog food 1,000 pounds at a time. 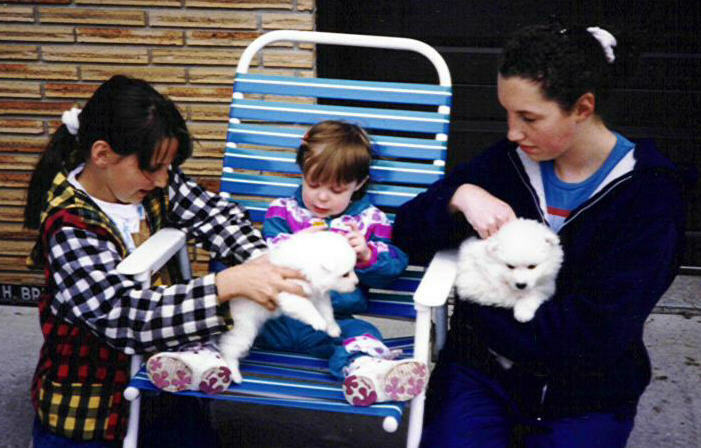 Mom and my three children who visited frequently were assigned the enjoyable task of naming the pups. People could not seem to get enough of Dad’s Dalmatians. Dad also raised Miniature American Eskimo pups. Sometimes a customer would have problems choosing a Dalmatian pup from among a litter. Knowing the responsibility of caring for a puppy can be overwhelming for new owners, Dad created a packet of materials to send home with each buyer: a sheet with a brief history of the Dalmatian breed, information on general care, housebreaking, and feeding tips; a list of possible names; history of that pup’s vaccines; sheet of frequently asked questions about puppies; bag of puppy chow. “We didn’t try to see how many puppies we could raise, but what good quality of puppies we could raise,” he said. An emphasis on cleanliness and honesty with his customers were other factors that helped. “I have people coming back for their third and fourth puppies,” he used to say. “They remember where they got their first pup and they were happy with it and the service they received. 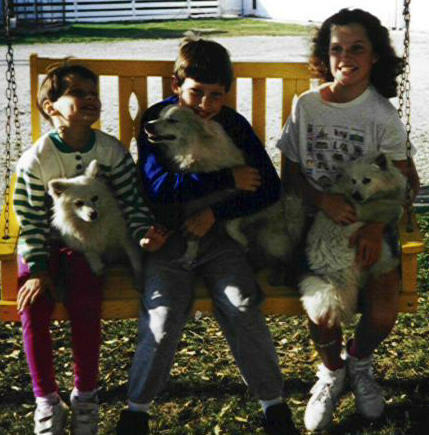 Later, Dad began raising Miniature American Eskimo pups too. But Dalmatians continued to be a favorite. They even brought Dad some recognition. Mom and Dad looked for ways to make people happy with their dogs. They visited schools and nursing homes and hosted groups of scouts and home schoolers at their farm. One little boy’s happiness was particularly important to them. During the summer of 1996, a 4-year-old boy in Fort Wayne witnessed an adult neighbor shooting his cat with a boy and arrow. Months later, the man received a sentence, but the boy was still heartbroken over the loss of his cat. Mom and Dad saw the news coverage of the incident. They were outraged by the incident. Dad turned to Mom. “Have we got a puppy we could give that little boy?” he asked her. She said yes and Dad contacted the mother of the boy. He told her he would deliver an 8-week-old Dalmatian puppy to the boy’s home. The little boy and his mother were delighted with the offer. Three local TV stations covered the meeting between my parents and the little boy as well as area newspapers, which put the story of Mom’s and Dad’s generosity on the front page. Dad’s Dalmatians brought him and his family much satisfaction and happiness. I’m proud to say he enjoyed sharing that with others. I didn’t know that G’ma and G’pa only started the dog business in 1990. Very interesting! Thanks. The pics make it really special. Love the one of all of you on the swing! Kay, I loved your story about dog pets and your Mom and Dad. Yes, I loved the entire story and pics. I also grew up on a 160 acre farm in NE Indiana. Carol: Glad you liked it. Those are precious photos and memories for us. We have a lot in common! We’ll have to talk more about our farm experiences. Loved your story on Dalmatians. Our children also grew up with a Dalmatian in the household. She was a great dog and loved running with my husband as he trained for marathons. Thanks for bringing back happy memories.